This 14-day Semi-live bowhunt takes place in the remote wilderness of the Northwest Province of South Africa. 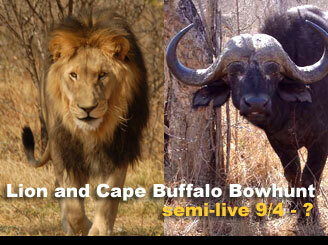 Lion and Buffalo bowhunting are very serious hunts for people experienced with Dangerous Game in Africa. This hunt is not to be taken lightly. The hunting method on this bowhunt is strictly spot and stalk by choice. No baiting, no dogs, no waterholes. This is a traditional Africa hunt on foot. What they call the walk and stalk. We will be utilizing traditional african trackers to determine where the game is, then we will try and spot the animals and move in for a close bow shot. Both hunts are done on thousands of acres of private lands in south africa. As with all south africa hunting, these are private hunting lands with managed wild animals. Both hunts conform to Safari Club rules of Fair Chase and exceed minimum requirements recently enacted by the South African Minister of Game and Parks. Equipment, methods, pending laws and ethics will be discussed during this hunt. This is one for the books..
There’s nothing like being in Africa. The flight in yesterday was a lot better than it was 2004. It seems SAA has made some changes for the better. I met Jimmy and Linda from Madiakgama Safaris and headed off for a long drive (6 hours) to their property in the NW Province of South Africa. During that time we discussed the hunt and decided that for my first day I would shoot a little and unwind by hunting a waterhole. This made good sense, this hunt was intense and I wanted a zebra anyway. After unpacking the gear and settling in- it was quite late. I popped a sleeping pill to get on Africa time and wiped out in no time. All in all we saw about 50 animals during the morning hunt. 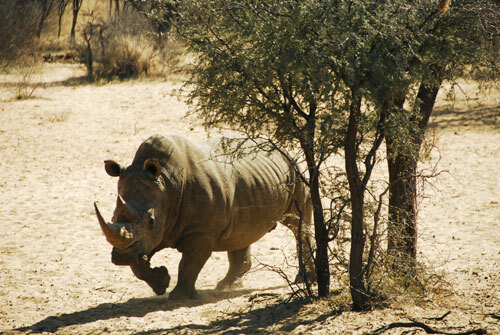 Lots of gemsbok, warthogs, ostrich, wildebeest, and of course, our rhino buddies. No zebra. We called it quits at midday and went back to the lodge for a nice lunch. Then it was right back into the same blind, this time with Linda, Jimmy’s wife. The afternoon was much slower. We had a couple of waterbuck join us along with one very annoying wildebeest bull who busted us. A few warthogs and kudu cows wrapped up the evening hunt and it was back to the lodge where I listed to stories about lion hunts, which had me at the edge of my seat. Tomorrow I will be hunting a lion.